My father taught me to use a slide rule. My father taught me the patience, the passion, the precision, the pleasure that goes into baking a cake, cream-filled choux, fruit compote. My father taught me to be humble. My father taught me to be confident. And my father taught me that one can, and one should be both. 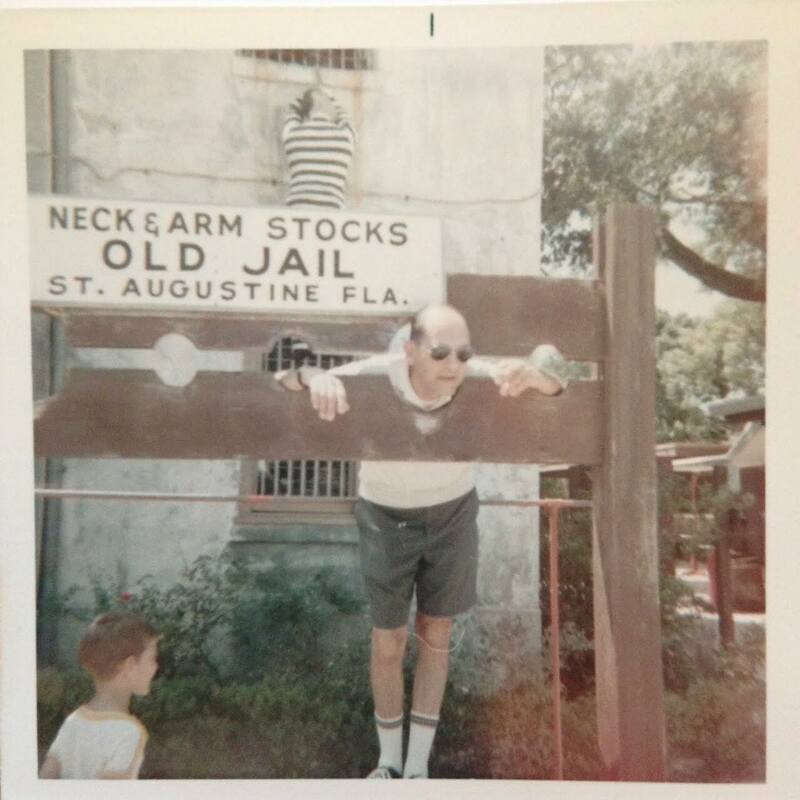 My father packed us into the old station wagon and invited us to see the world: St. Augustine’s Old Fort and Fountain of Youth; the Antique Car Museum and the Ringling Brothers Circus Museum; Cyprus Gardens and Disney World; adventure after adventure. Far and wide. Hand in hand. My father taught us to swim just like he was taught to swim, by being tossed into the deep end and made to kick and paddle until we reached his waiting arms. I suspected that he slowly walked backwards, farther and farther from the wall, making me swim farther and farther into the deep. My father took us, every February, to the strawberry farms to pick berries, squatting with us, four small children, among the lush green looking for the perfect red. 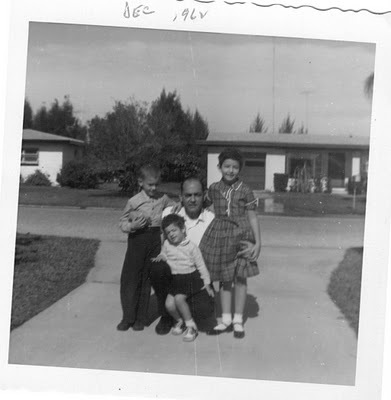 My father took us every chilly Florida December across the river to the citrus groves to pick oranges, bringing home brown paper grocery bags bursting with sunny tangerines, oranges, and grapefruit. My father, who must not have minded us laughing at him, planted a single lemon tree in the barren wasteland that was our backyard, a tree that gave him a single lemon, or not many more. Just for the pride and satisfaction of having a lemon tree. My father, with the patience of a saint, ignoring his children’s silly, irreverent remarks, dug up and planted a garden in the hard Florida sand at the side of the house, growing tomatoes and chili peppers which were eaten by no one. Chasing that damn mole around the yard with a shovel. 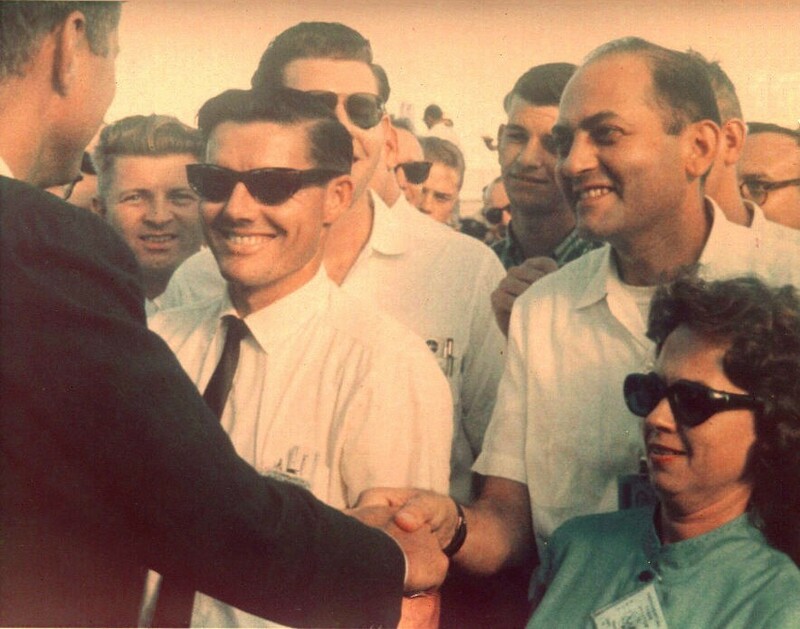 My father, with the patience of a saint, sat and calmly ate his dinner as we harangued and lectured him on social issues, as we voiced our collective opinion that the money spent sending men to the moon could be used to feed and house the poor. Poor man. My father tried to raise me to be brave, yet came to rescue me each time a palmetto bug skittled across my bedroom floor or a silverfish appeared in the bathroom, never happy that I couldn’t do this myself. Sigh. My father tried to teach me to drive stickshift in that rusty old VW Bug in the parking lot behind the grocery store and movie theater plaza. His patience wore thin, my eyes burned with tears, the car stalled out. Over and over again, one more try. Epic fail. My father tried to teach me calculus, his intricately mathematical explanations worthy of the finest NASA engineer but of little use or understanding to a high school student with nary an interest in calculus. Fortitude. My father helped me build the coolest model of DNA for 9th grade biology class, little wooden balls in yellow, green, red and blue, white plastic tubing twining up and up and up. My father doled out quarters, dimes, and nickels for good grades every six weeks as our report cards were handed over to his scrutiny. We took great pride and pleasure in earning his. My father loved to toss steaks onto the old charcoal grill, flip pancakes on the griddle, offer us charbroiled burgers and hot dogs, make breakfast for dinner. His hoagies were the best. My father took us weekly to Dairy Queen (or Dairy Dip as he called it, much to our embarrassment and – later – delight) for chocolate dipped soft serve cones or Dilly Bars on a stick, his own great delight. My father had a monumental sweet tooth, keeping the house well-stocked with hard candies, sour balls and Jolly Ranchers strewn across the kitchen counter much the way his father’s desk would be littered with diamonds, the freezer packed with gallons of ice cream and tubs of Cool Whip, the fridge stuffed with fruit pies, syrupy cooked prunes and apricots, a never-ending supply of pudding and choux. Sheet cakes his specialty. Sweets were never off limits. Sweets from the sweet. Every summer, my father packed us into the station wagon and drove us up to New York (his few belongings stuffed into a brown paper grocery bag and tossed in the back), a single stop overnight at South of the Border, the radio tuned to All News All the Time, non-stop loop of news. He gave up his two-week vacation for my mother, one week with her parents, the second week with her sister, and back home, back to work again. 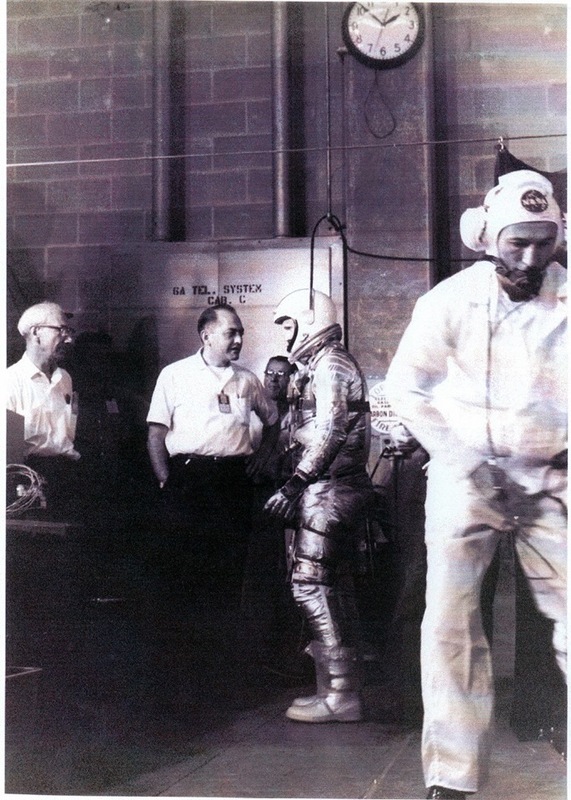 My father sent men into space. To the moon, Alice! My father taught us how to give, to be generous, self-sacrificing, compassionate. And how to ask little in return (to a fault). A heart of gold, the best man I have known. A man much like the father of my own children. My father raised us, his daughters, to be as strong, powerful, educated, independent as his sons, a man ahead of his time, a man raised by strong women. My father taught me, his daughter, to work hard, to do my best, to rely on myself before I relied on any man. My father gave us each a tight hug, a kiss, and an “I love you” every single night of our lives that we lived at home and whenever he saw us. Never ever letting us forget that he cherished us. At the end we took care of him as he sunk into illness, into a world silent and childlike. He trusted us to feed him and wash him and dress him and take him to the dentist or to daycare, as we handed him graham crackers to eat and guided the crayons away from his mouth and towards the coloring books. The last time I saw him I wasn’t sure that he recognized me anymore, knew who I was even as he submitted. One afternoon as my mother and I were helping him through the house he stopped and looked at us. Looked from her to me and back again several times. He then gently took her hand and gently took my hand and put them together, our hands clasped between his own. A ghost of a smile, all he could muster. And I knew that he recognized me as his and her daughter. Oh Jamie! This Fathers Day blog was so touching! Thank you! I will be moving to France on Sept. 15th. I hope we can get together again and “put the I into IACP”. Thank you so much, Denise. And I cannot wait for you to move here! I hope we’ll be neighbors! We’ll definitely do stuff together! What a lucky woman you are, and what a lucky man your father had during the days before we get robbed of ourselves in the golden time of life. I had a great dad as well and reading your blog about him, made me think about my Dad who has been gone a long time now and all things he taught me. Thank you for that lovely reminder and your story, it was so timely. What a most touching post and a wonderful tribute to your talented Dad, Jamie. Loved reading every word. Good luck with the heatwave this week! I used to know how to use a slide rule. Haven’t thought about them in ages. And I love Florida strawberries. The best, IMO. Particularly in February. Anyway, such a nice post — wonderful tribute to your father. Thanks. Add a little sunshine to every meal with these sweet and savory recipes. Jamie Schler offers a collection of sophisticated and sunny recipes using the most versatile of citrus fruits, the orange, in this beautifully photographed cookbook. I'm Jamie; welcome to the new Life's a Feast! I run a hotel in Chinon, France, and write about life, culture, modern day living and food. My passion is to create vibrant and unique experiences. © 2015 - 2016 All rights reserved. All content on this web site, such as text, graphics, logos and pictures is the property of the author; to use, display, derivate or copy any works on this website please contact the author for permission.